Peel and slice the onion. Peel the garlic and slice it as finely as possible. Lightly brown the garlic and onion in a little oil. Add the tomato paste, tomato vinegar and cook for a few minutes over a low heat. Add remaining ingredients and simmer for ten minutes. Pour into a previously prepared sterilised jar, leave to cool then place in the refrigerator. It will be even better if the sauce is made the day before. Prepare the ribs the night before. To do so, remove the membrane from the undersides of the bones and score the fat in a criss-cross pattern. Place the ribs in a deep dish, brush with the barbecue sauce, cover with plastic foil and refrigerate overnight. Preheat the barbeque to low heat. Wrap the ribs in aluminium foil and grill for 1 hour and 30 minutes. Turn the meat and cook for another hour. Remove aluminium foil and let it rest for 15 minutes before serving. Gently pull down the leaves in two halves, keeping leaves attached at the bottom, and remove the silk. Pull leaves back up and soak for about 15 minutes to prevent them from burning when cooking. Drain thoroughly. Prepare the flavoured butter by working smoked paprika and lime zest into the softened butter. Brush the corn with the flavoured butter. Cook them on the barbecue over a medium heat for 10 to 15 minutes, turning frequently and basting them with the remaining flavoured butter. 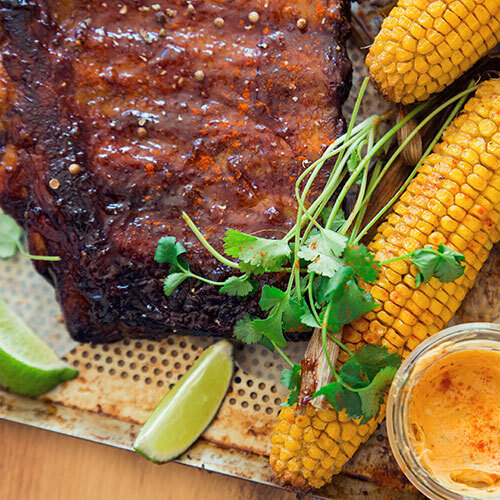 Serve the ribs with the corn on the cobs and the remaining barbecue sauce.